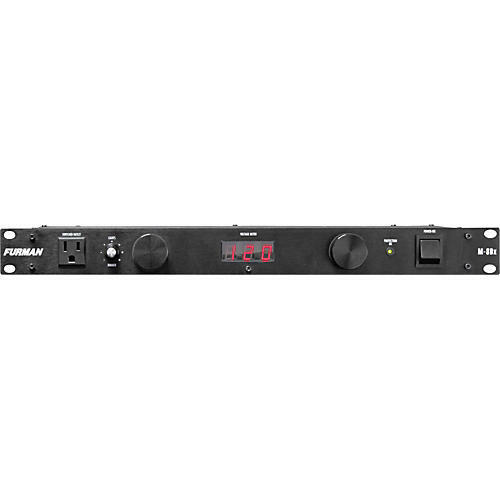 The M-8DX power conditioner protects your audio electronic equipment by combining high voltage varistor (MOV) surge and transient suppressors. The fast-acting suppression circuit quickly responds and clamps transient voltages to safe levels. An RFI/EMI interference filter works to prevent noise from fluorescent lights, certain dimmers, radio transmitters, and similar sources of electronic pollution from contaminating the AC line and from there, leaking into sensitive audio, video, or computer circuits. NRTL/TUV listed. Featuring two slide-out, swiveling light fixtures, The Furman M-8DX Conditioner provides discreet illumination of your equipment on stages, in studios, and in other dark places. A dimmer knob lets you adjust the lamp brightness to just the right level. It also features a digital LED voltmeter to display incoming line voltages. Make sure that your gear operates at optimal voltage. Its life and your sound depends on it! Make sure that your gear operates at optimal voltage. It's life and your sound depends on it.